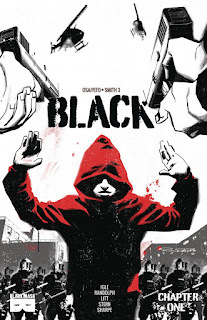 A quick breakdown of facts: Black started out as a Kickstarter before getting picked up by Black Mask Studios. They raised almost 4 times what they wanted in the original Kickstarter which gave them a grand total of 91thousand dollars... that's pretty impressive. So the story concept, well a world where people mutate with superpowers...except that only black people have superpowers. The story opens with a police shooting. An over zealous white cop shoots three young black teens. The artwork is pretty awesome for me. I love black and white comics. Think like... the black and white art of The Walking Dead books- with similarly realistic representations. One of the things that sort of irked me right away is a little continuity problem in Issue 1. We've got this female cop relaying the extraordinary events she saw on a particular day so one would assume you would only be viewing what that cop personally witnessed. Sadly that isn't what happens. At one point they divert from this narrative and show us a snippet of what ONLY our young fugitive is privy to. After that, the original narrative is abandoned for the remainder of issue 1 and the story continues as a third person omnipotent narrative which begs the question: why did they bother with the opening narrative at all. WOW I said narrative too many times. Anyway, lets be honest, writers can do whatever the hell they want, this is just a personal pet peeve for me so... subjective? By issue two we're seeing the officer again and our fugitive is picked up by.. oh boy, a secret underground operative! I didn't see that coming... wait I completely did, I just really hoped for something else. However less expected (WARNING: Mild Spoiler) is that the FBI is not only trying to catch these super powered black people but killing any witnesses to their powers.. which includes a lot of white people. 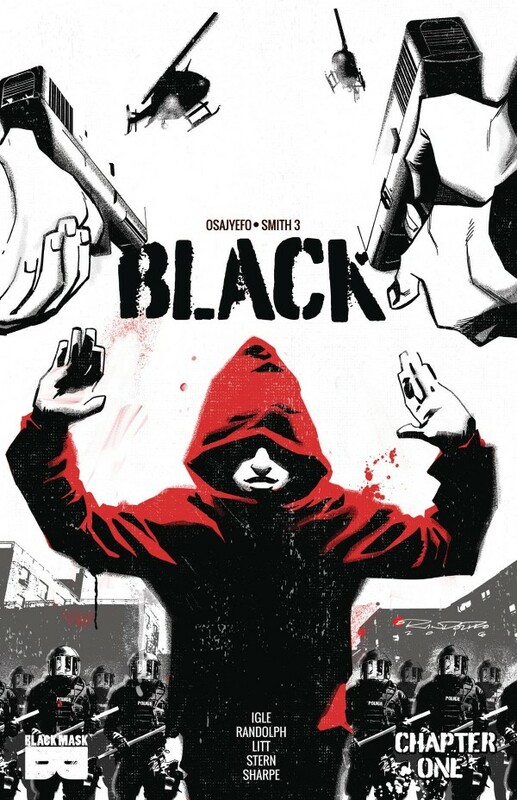 Although the concept of super powers is by no means unique, as well as an underground operation to train said super-powered people, the plot being centered around race allows writers to address important political, and racial issues that aren't often addressed in comics. Of course, I can't really get into any of that without spoiling the story... but its there (as well as a transgendered person who make a brief appearance... hopefully she has more of a role in the future). Oh and fun fact about issue 2, one of the characters ends up in a sweet restorative tank that looks exactly like the one Luke is submerged into in The Empire Strikes Back. With the emphasis on race in the books, this makes this story controversial and well, pretty honest. I like it. Issues 1-3 are currently available at a comic book store near you! Before reading my review of issue #2, you may wish to watch my thoughts and coverage of issue one and don't forget to subscribe to my YouTube channel! Issue #2 of The Skeptics is currently available from Black Mask Studios as of November 30th. I hadn't previously spoiled the ending of this issue one but for the sake of a thorough review I'm going to spoil it now. At the end of issue #1, our two young grifters found more than they thought they would within the government facility. They found genetic experiments in the form of humans with telepathic abilities, these are supposed to be the soviet super weapons. At least that's what I gathered from the brief moment our two protagonists. With the beginning of issue #2, the grifters are apprehended by the authorities. They have no intention of giving themselves up for phonies however and they insist they are now telepathic. They further play up the charade by insisting that they can read the minds of everyone around them. This is all for the sake of finding a specific file all about the soviets super weapon, the twins. Unfortunately, our protagonists are shoved up on stage with the president AND the soviet twins who quickly announce LIVE that the two american teenagers have no psychic abilities. The issue leaves off with a chaotic montage illustrating the fear and panic our charlatans must face in the coming issue. Devaki's use of foreground in this particular panel really drew my eyes in on this page. It ended up being my favorite page and it was the first one in the issue. She does this a few more times throughout the issue and I really like this cropping effect as often times artists attempt to show us too much and panels can end up feeling rather cold. Perhaps that's a completely personal opinion that only I share LOL. Although this issue isn't terribly long, is does take you right up to the point where the plot thickens. How are our little teenage grifters going to get out of this one? What are the consequences for deceiving the president and attempting to fool the american public & free press? I suspect they'll be thrown straight into prison unless they can turn the situation around and somehow infer that the soviets are the ones who aren't psychic which really, isn't that what the american government wants?